The Gospels record Jesus healing on the Sabbath several times. In each case, Jesus challenges the understanding of the Pharisees and other legal experts regarding God’s commands. Deuteronomy 5:12-14 commands Israel to obey God by resting on the Sabbath. The commandment was a reminder to the Israelites that the Lord brought them out of Egypt where they had been slaves and continuously worked under harsh conditions. This command, and indeed all Ten Commandments, showed the Israelites then, and we the people of God today, how to orient our hearts toward God and humanity: to love the Lord with all of our being, and to love our neighbors as ourselves (Mark 12:29-31). The Pharisees often gave their interpretations of the laws greater weight than the condition of their hearts toward God and others. They were good at observing the Sabbath, but they would permit healing or the rescue of a person or an animal like an ox (which could be interpreted as a violation of the law) only if it was apparent the life would end before the end of the day. But the issue Jesus inquired, was the condition of their hearts. Instead of finding freedom to flourish under God’s law, they were enslaved to it. Jesus’ act of healing the man on the Sabbath reflected his heart for man and ultimately the Lord. James 1:25 and 27 remind us that the perfect law is designed to give us freedom, and in that freedom we are directed “to look after orphans and widows in their distress and to keep oneself from being polluted by the world.” Micah 6:8 reminds us that the Lord requires us to act justly, love mercy, and to walk humbly with the Lord. By supposedly “violating” the fourth commandment and doing “work” on the Sabbath, Jesus showed us how to care for the least, lost, and last by demonstrating compassion and mercy, while still honoring the law. Although we don’t know much about Jesus’ encounter with this man, we know that the man visibly suffered in the presence of the Pharisees, and the dinner party carried on despite the man’s agony. 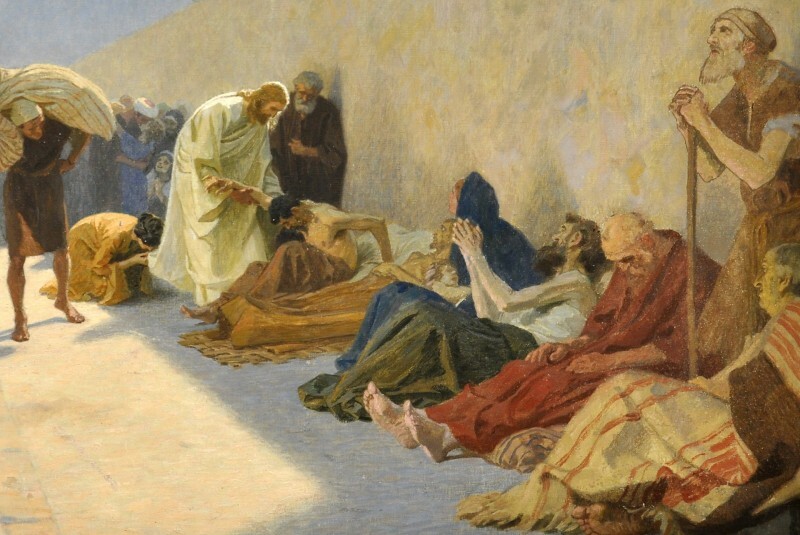 Jesus’ healing of the man was an act of love because it released him from suffering and the scorn or shame that those who were chronically ill often experienced. Earlier in Luke 5:31, Jesus was questioned as to why he spent time with sinners. He responded, “It is not the healthy who need a doctor, but the sick. I have not come to call the righteous, but sinners to repentance.” By “working,” Jesus offered the man with dropsy freedom from pain and alienation. Have there been times in our lives where legalism prevailed over grace? This passage is about dedicating the Sabbath as a day of holy rest, but it is also about God’s care for humanity, especially when his creation is suffering. On this Sabbath, let us dedicate this day of rest to the Lord. As we obey, may we not forget to also show compassion to our neighbors as we love the Father with our whole heart, mind, and body. Lord, on this Sabbath during Lent, we desire to keep the day holy. As we rest, may we remember that you are Jehova Rapha, the great healer. As you sanctify us, instead of being enslaved to legalism, please give us opportunities to show your love and healing power to the people around us. Katherine Haley is long-time parishioner of The Falls Church Anglican, first attending the church as a Falls Church Fellow. She is an active member and also serves on the vestry.